DLL Hell is most frequent word during the interview session. Why it is and the reason of its occurrence. In this article I’m going to share the reason of its occurrence and the resolution. Now few scenarios come in front of us during the production time. 1. I have two applications, A and B installed, both of them installed on my PC. 3. Somehow, I have a latest version of SharedApp.dll and installed on my PC. 4. The latest SharedApp.dll overwrite the existing .dll, Which App A was also using earlier. 5. Now App B works fine while App A doesn’t work properly cause to the newly created SharedApp.dll. In short a newer version of .dll is not compatible with Old app .Here SharedApp.dll is with new version which is not backward compatible with App A. Now the resolution of this is after introducing Versioning in .Net with shared assemblies. Which is placed in GAC (Global Assembly cache).Its path “C:\Windows\assembly” and the screen shot of GAC how it looks like depicted below in image. GAC contains strong named assemblies. Strong named assemblies in .NET have 4 pieces in its name as listed below. If you look into the images above, you can find that Microsoft.Interop.Security.AzRoles assembly has version 2.0.0.0. Now recall the Dll Hell problem with newer face with versioning concept. 2. Both of these applications use shared assembly SharedApp.dll having version 1.0.0.0. 3. Somehow, I have a latest version (2.0.0.0) of SharedApp.dll and install It into GAC. 5. Now App A uses its old dll with version 1.0.0.0 and App B works perfectly with SharedApp.dll version 2.0.0.0. In summarize words .Net .Dll versioning helped to resolve this DLL Hell problem. The purpose of this article is to provide security to a database column's value so that no one can understand what the actual value is. Scenario: Actually a few days ago I had the situation to add one more layer of security, like encryption and decryption of some keys (for example SaltKey or RSAKey), that were being used in my C# code base file. These keys were being used to encrypt and decrypt the username and password, however I don't want to make these keys public to anyone (for example SaltKey or RSAKey) , because anyone can read this easily using reflector if obfuscation is not applied to the C# code base file (.cs file). So I thought to put these keys into the database and put up all the columns values in encrypted mode and decrypt it since I needed the actual values of these keys. I studied about this from various portals before implementing. In this article I'll also share some findings that may be helpful to you to create rudimentary queries. 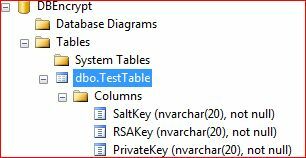 There are many approaches to implement encryption but I've chosen column encryption of a database table. I just encrypted and decrypted the data placed in the table. This approach takes little time to do the required procedure than the other approach. Create a master key, each database can have one master key and this master key used to protect the private keys of the certificates. After this we'll create a certificate to encrypt the data in the database and symmetric key (the symmetric key used by the sender and the receiver of a message, it's a common key used to encrypt and decrypt the message). We've created a symmetric key using the certificate (EncryptTestCert). 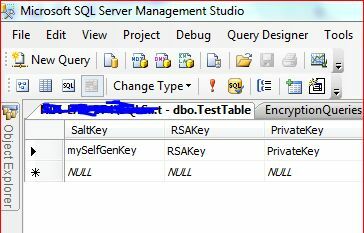 Now it's time to create another three columns that will keep encrypted data of these three columns (SaltKey, RSAKey and PrivateKey) of table respectively. I've also added one more Column SaltKeyEnCol2 as nvarchar(max). I will share the reason to create an extra column later in this document. columns above with an alter commnad. Also note that we are using the same certificate(EncryptTestCert) to open the symmetric key and make it available for use. Kindly have a look at the syntax given below. If you notice in the image above, it only shows you <Binary data> in encrypted Columns. Which was a little tricky for me initially, after looking at these values I thought I made some mistake and the data doesn't look OK.
As we can see above, we've achived the encryption of the required columns. Now the turn is to decrypt the data placed in the encrypted columns. Kindly refer to the image given below with the outcome. I hope it will help you somewhere. I took the idea from: Introduction to SQL Server Encryption and Symmetric Key Encryption. There is a very good feature to achieve commit and roll back in LINQ using TransactionScope. For an example you are having two table named as Customer and customerDetails. As I've declared two tables ,Let's create a scenario , Suppose you have updated some value in current context using db.SubmitChanges() for customer table whilst other hand any exception occurs for customerDetails table then it would be weird . Our main target is to achieve roll back transactions if something goes wrong ,rather than saving uncompleted code. This is the optimum ways i found during last day .So sharing my thoughts.